The Brahmaputra and Jia Bharali rivers are flowing above the danger level in Assam and in Uttar Pradesh water level in major rivers including Ganga, Sharda and Ghaghra is rising continuously due to heavy rain. Seven districts of Assam are affected by floods hitting nearly 60,000 people and damaging farm fields with standing crops, official sources said. The Brahmaputra was flowing above the danger level at Neamatighat in Jorhat district while the Jia Bharali at N T Road crossing in Sonitpur district in lower Assam, the sources said in Guwahati on Saturday. In the worst-hit Dhemaji district, most of the roads had been damaged or affected by the floods that have completely or partially submerged several roads. Several road embankments have been eroded and approaches of bridges and culverts washed away by the floods, they said. Three relief camps were opened in the district where nearly a 1000 people were taking shelter. 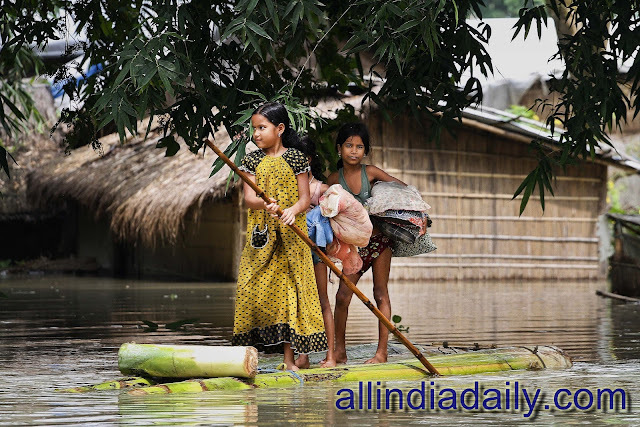 The flood-affected districts are Dhemaji, Tinsukia, Golaghat, Jorhat, Kamrup, Karimganj and Lakhimpur. With heavy rainfall lashing various parts of Uttar Pradesh during the past 24 hours, water level in major rivers including Ganga, Sharda and Ghaghra, continued to rise, putting the authorities on alert. According to Central Water Commission report on Saturday, Sharda was flowing above the danger mark in Palian Kala, which received 21.8 mm rainfall in the last 24 hours. Ghaghra was flowing above danger mark at Elgin Bridge in Barabanki, and was near red mark at Ayodhya and Turtipar in Ballia district. Kwano was flowing above red mark at Chandradeep Ghat in Gonda district which received 152 mm rainfall. The river was rising at Basti and Sant Kanir Nagar. Ganga was rising at Gumtia (Kannauj), Ankinghat (Kanpur), Kanpur, Dalmau, Chatnaag, Mirzapur, Varanasi, Ghazipur and Ballia. Birdghat in Gorakhpur received the maximum 335 mm of rainfall, followed by 332.2 mm in Uskabazar in Siddhath Nagar district, 210 mm in Bansi in Siddharth Nagar, 186.6 in Ringauli (Gorakhpur), 174.2 in Ayodhya, 136 in Balrampur, 124.7 in Sultanpur and 88.2 mm in Jaunpur district. As per the report from relief commissioner's office, 14 districts of the state have been affected by floods. These, include 81 villages in Bijnor, 135 in Lakhimpur, 77 in Muzaffarnagar, 32 in Sitapur, 71 in Merrut, 10 in Bahraich, 22 in Aligarh, 75 in Farukkhabad, 18 in Rampur, 5 in Barabanki and 8 villages in Faizabad district. Torrential rains lashed Gorakhpur district flooding low-lying areas and disrupting normal life. Streets were under knee-deep water as the district received 342.9 mm of rains since Friday. Water had entered many offices and power sub-stations resulting in outages, officials said. Trees were uprooted at many places and several mud houses had collapsed, they said.